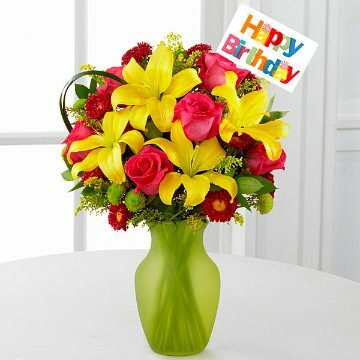 This bouquet includes: hot pink roses, red Matsumoto asters, green button poms, yellow Asiatic lilies, yellow solidago, lush greens and lily grass blades. Presented with a green glass vase. Accented with a colorful "Happy Birthday" pic. Standard bouquet Includes 10 stems. Approximately 16"H x 11"W.
Deluxe bouquet includes 14 stems. Approximately 17"H x 13"W.
Premium bouquet includes 17 stems. Approximately 18"H x 14"W.